"Sepet" wins Best Asian Film award at the 18th Tokyo International Film Festival. Singaporean Eric Khoo's "Be With Me", which was featured in this years Cannes Directors Fortnight, won the Special Mention. Last year's winner for the same award was "Possible Changes" from Korea, and the year before that, it was "Memories of Murder", also from Korea. "Memories of Murder" was competing with "Rabun" at the Torino International Film Festival in Italy, three years ago. Announcing The Storyteller Club members' second screening of GUBRA. Hey, chaps and chapesses. The last screening was shown on a small tv, with poor sound, and street noises just below the windows. It was also the old edit. I propose to make a proper screening of the new and vastly-improved edit at my office theatre sometime today or tomorrow, before I fly off to Sydney on Saturday. Remember, the theatre can only seat 15 to 20 arses, so as always, it's first book first booked basis. Oh, and old-timers, die-hards and regulars get first priority, of course. its odour and its glory. as new as the sun that everyday renews. Of course, newspapers avoid the whole subject." Bhopal 2005. Rashida Bee's nieces apply mehendi (henna) on the palm of my hands. The picture you see here is one of joy and warm hospitality. It was taken in September 2005; we were in the living room of the humble but cheerful home of Rashida Bee, Bhopal tragedy survivor and leading activist. But things weren't always this happy in Bhopal. 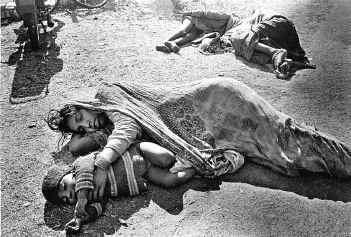 On December 3, 1984, more than 27 tons of poisonous gases leaked from a storage tank at a Union Carbide pesticide factory into the heart of Bhopal city, immediately killing 8,000 people. Since then, more than 20,000 deaths have been attributed to the disaster. Survivors and their children continue to suffer long-term health effects ranging from cancer and tuberculosis to birth defects and chronic fevers. Multiple studies have found mercury, nickel and other toxins in the local groundwater and dangerous levels of toxins including lead in the breast milk of women who live near the factory zone. "We are still finding children being born without lips, noses or ears. Sometimes complete hands are missing, and women have severe reproductive problems," according to Bee, who herself still suffers from respiratory and vision problems from gas exposure. I decided to show here two contrasting pictures, because to me, today, 21 years later, Bhopal shows the world just how the human spirit can triumph over almost anything that life has to throw it. Some Malaysian short films that make our mainstream stuff look like college work. Go watch this. And for more reasons than one. 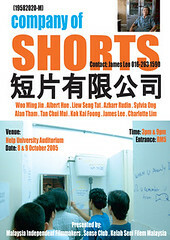 Seng Tat's best film so far, "Flowers", in which I play a prostitute, is among them. Also, Azhar Rudin's amazing "Majidee" is there too. In this, we merely follow a young man on his journey by foot from Puduraya to an LRT station, but to me, it's one of the finest bits of writing and filmmaking I've ever seen come out of this cultural desert we call home.